The 2017 NFL Draft class is full of talent running deep into the draft. One of the deepest positions in the draft this year is at defensive end, including the top two prospects overall. But who is No. 1? After Overtime highlights the top 10 DE’s here. Solomon Thomas, Stanford, 6’3” 273 LBS. Solomon Thomas has been falsely categorized at times as a tweener but when taking a closer look at his combination of skills, it becomes clear that he is a defensive end, regardless if that’s in a 3-4 or 4-3 scheme. Thomas helped prove this at the combine by finishing in the top five out of all defensive lineman in the bench press, vertical jump, broad jump, 3-cone drill and 20-yard shuttle. He is an outstanding athlete who uses elite hand moves to get away from blockers. His motor is always running and has great leadership qualities. The one knock on Thomas is that he is a bit of a stiff runner and can have trouble repositioning himself on tackles. 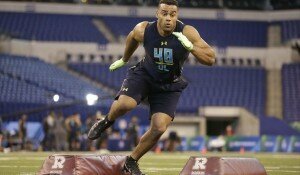 Solomon Thomas is a player that will make an immediate impact for any defense and has early All-Pro potential. Thomas is a likely top five pick in the draft. 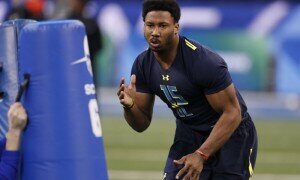 Myles Garrett, Texas A&M, 6’4” 272 LBS. Myles Garrett is first on this list by just about all other media member’s estimations. When simply looking at Garrett you can see why. Garrett has the elite length, strength and explosion you see in the game’s best pass rushers. He is explosive off the line and can find his way around blockers with a variety of moves. I have reservations though. When facing stronger offensive lineman, Garrett has found trouble when he doesn’t beat them off the snap. Garrett also struggles as a run defender, often finding himself out of position to make the play. Garrett’s motor is on and off. He gives tremendous effort in his pursuit of the quarterback but as plays develop away from him he will often pull up and rely on teammates to make the play. Garrett has the physical tools of a generational prospect but when watching him play it doesn’t always appear that his heart is in the game. He is still a safe draft pick though because even 70 percent effort from his level of athleticism could result in 10-sack seasons—imagine if a team gets him to 100 percent. Garrett is the likely No.1 overall pick in the draft. 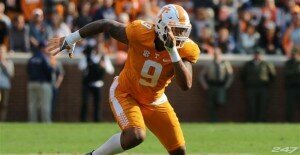 Derek Barnett, Tennessee, 6’3” 259 LBS. Derek Barnett has been one of the most productive defensive ends in college football for three years now. He played in all 36 games of his college career and averaged over 10 sacks per season. Barnett is the most skilled block shedder in this year’s defensive end class, primarily with his hand moves. 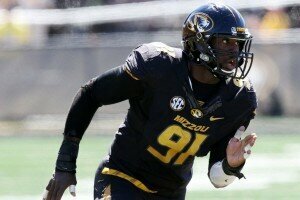 He is tight hipped however and will be best utilized as a 4-3 defensive end. Barnett has solid tackling ability, racking up over 130 tackles in his 3 seasons at Tennessee. He needs to build more confidence in his ability to read plays. When he does decide, opposing offenses are in trouble because Barnett is one of the hardest hitters in this draft class. Barnett should be taken early-to-mid first round of the draft. 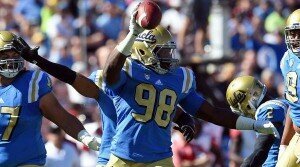 Takkarist McKinley, UCLA, 6’2” 250 LBS. Takkarist McKinley was a tough guy to keep on this list, not because of his ability but because of how well he might fit as a 3-4 outside linebacker. His production behind the line of scrimmage this season however pushed me into keeping him as an edge rusher. In 2016, McKinley had 10 sacks and another 18 tackles for a loss. McKinley must work on his hand moves and upper body strength to compete consistently with NFL blockers. He shines in the speed and motor departments. With a 4.59 second 40-yard-dash time, McKinley posted the fastest time of all players that I have projected as defensive lineman. He also refuses to give up on plays and never is seen taking plays off. McKinley is a solid tackler and will add an athletic presence to whichever team drafts him. He is a late first round pick. Charles Harris, Missouri, 6’3” 253 LBS. Charles Harris is going to transition to the NFL well. He is one of the smaller defensive ends in this class but makes up for it with his burst and elite feet movement. Harris doesn’t have great strength but uses his initial burst to help him bower through blockers. Harris plays a bit heavier than teams like for a player coming off the edge and doesn’t have the strength of a player who you would want to keep inside consistently. His motor and ability to shed blockers with a variety of moves, especially his span, should make him a productive option for a team looking to bolster their pass rush. Expect to see Harris’ name called in the late first round. 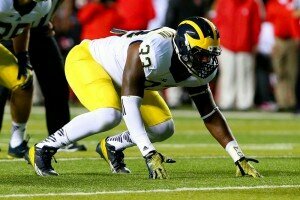 Taco Charlton, Michigan, 6’6” 277 LBS. Vidauntae Charlton, who was nicknamed “Taco” by his grandmother before he was even born, has an intriguing skill set as an NFL prospect. You can’t teach 6’6”. He also has the hip flexibility to maneuver around offensive lineman. Taco doesn’t show the toughness you would like to see in a player of his size and shows inconsistent game speed. At the combine, Charlton really failed to shine in any drills and with only 15 career starts, a good workout would have helped him a lot. Charlton does have the upper body strength you would like to see for a player setting the edge and can use his length to reach into open gaps and tackle ball carriers. Taco Charlton should be an early second round selection. 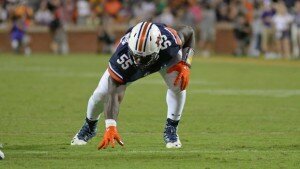 Carl Lawson, Auburn, 6’2” 261 LBS. Injuries left Carl Lawson’s NFL future in doubt, but an outstanding senior season with Auburn has brought his name back into the conversation for the best defensive ends in the country. Lawson is great against the run and can use his burst to get outside of the tackle or work his way inside of gaps. Lawson plays a bit stiff, which may be a result of his hip and ACL injuries, but he also is arguably the strongest of all defensive lineman in the draft. This was on display at the combine when Lawson left as the 2017 combine leader on the bench press. If he can stay healthy, Lawson has a chance to be very productive. Lawson should be an early-to-mid second round pick. 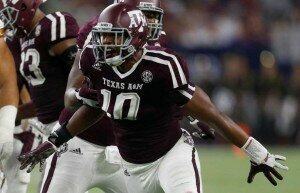 Daeshon Hall, Texas A&M, 6’5” 266 LBS. Wildly overshadowed by Garrett, who plays at the opposite end of the line, Daeshon Hall has been a major contributor for Texas A&M every season. Hall is a complete effort player, chasing down ball carriers and working his way between blockers. He has experience at multiple positions but translates best as a 4-3 defensive end. Hall’s biggest knock is his lack of strength. Hall has a great motor that results in him constantly being involved in plays. Having only played with a hand on the ground in his senior season however, teams may seem him as a strength development project with a high ceiling. Hall projects as a late second/early third round pick. Tarell Basham, Ohio, 6’4” 269 LBS. Tarell Basham is a sleeper that will be a valuable addition to any NFL roster. Toughness is the name of his game. Basham is a physical defensive end who has good burst and applies a solid pop to offensive linemen off the snap. He is not strong enough to play defensive tackle at the next level but he has a solid tackle skill set. He plays a bit too physical at times and he will need to learn to attack the edge more often to become a consistent pass rusher. He has enough athleticism to play as a 3-4 or 4-3 defensive end. Basham should be drafted in the third round. 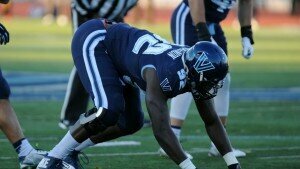 Tanoh Kpassagnon, Villanova, 6’7” 289 LBS. Tanoh Kpassagnon may round out the list and be coming from an FCS school but do not sleep on the potential here. He is the biggest player on this list by height, weight and arm length. He is an athletic build too, so he is certainly an intimidating force to look at. Freakish athleticism like this does not come around early which may cause him to go sooner than expected. Kpassagnon has good burst off the line and the power to push back blockers. Sometimes he can be too physical with blockers and get lost in the play. His energy also seems to get drained quickly, and he has trouble keeping up with plays that force him to change direction. He is a very raw talent but has potential to play just about anywhere across the line and possibly as 3-4 linebacker. It is all going to depend on what the coaches who draft him see in him. Kpassagnon should be a fourth-round pick.